Welcome to Own the Yard! My name is Spencer Haws and I’m the creator of Own the Yard, your one stop site for all your backyard ideas, backyard product reviews, and a place to help you build the best backyard experience possible. So about 2 years ago, my family and I decided it was time to move. As you know, so many factors and decisions come into play when deciding to buy a new home. In today’s day and age with technology, smart phones, and a device everywhere you look…I wanted to give my children the opportunity to have a backyard that would tempt them constantly to go out and explore and have some fun. 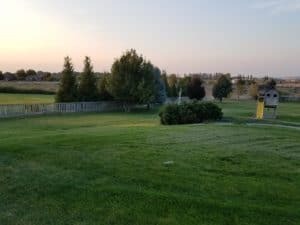 Along the way, I’ve discovered that there are so many products, landscape ideas, tools, projects, and events that we consider for our backyard that I wanted to share a bit of my journey. My goal for the site is to share what I learn as I live the backyard life (whenever possible) and find the products, tools, or ideas that appear to be the best. Hopefully some of what I share will inspire you with design, landscape, or other ideas as well as help you make a more informed buying decisions to “stock up” your own yard. When I’m not working on this little “side project” of a website, you might find me publishing articles on my more business oriented blog here. My name is Hannah Murley and I’m an editor and author for Own The Yard. I’ve always had a passion for writing and homemaking, and they’re two passions that I feel really make a positive difference. Working with everyone at Own The Yard has been a wonderful way for me to combine my two interests. It’s a joy for me to compile backyard design ideas and outdoor family games together into articles and cultivate my creativity in doing so. To me, one of the most important things a person can do is get away from the influence of the world and live a life you can love and be comfortable with. And I think that Own The Yard does a great job at bringing people ideas for how they can live that fun-filled, family-oriented life – and I strive to do my part to further that goal in any way I can.